Depression in the elderly is prevalent in patients undergoing transcatheter or surgical aortic valve replacement. A recent multi-centre prospective cohort study explored the relationship between the symptoms of depression and these procedures and found that patients with evidence of depression at baseline were at a subsequently higher risk of mortality. 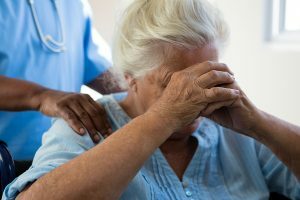 In this study, FRAILTY-AVR, researchers looked at depression symptoms in 1035 older adults aged >70 years undergoing transcatheter or surgical aortic valve replacement. Of these, 31.5% had evidence of depression at baseline and a higher risk of short- and mid-term mortality. Furthermore, the risk of mortality increased in patients where depressive symptoms persisted after the procedure. In fact the highest risk cohort had a three-fold increased risk of mortality at 12 months afterwards. The study authors suggest that screening for depression prior to these procedures may help reduce mortality in this patient population. The aging population means that this problem is not going away any time soon. Conversations regarding the benefits of screening for depression to reduce mortality in certain patient populations are a step in the right direction.